I'm very happy to be back today after quite an absent week last week (day jobs got on top of me!) sharing with you all my latest crafty adventures :) First up is this fun tea-cosy, I've had it in my head for a while so it's great to get it finished up! The apple and pear fabric is a Kokka print that I've been hoarding for far too long, yayy so pleased to see it put to good use at last! and the red/white polka dot is an old Timeless Treasures fabric, it's one of my 'go-to' prints that I love using again and again. I really love how it turned out, I think it has a cute kitschy feel to it, which is what I'd hoped for ;) I will be sharing a tutorial on how to make it sometime soon, so check back soon! i love your backing and binding choices! 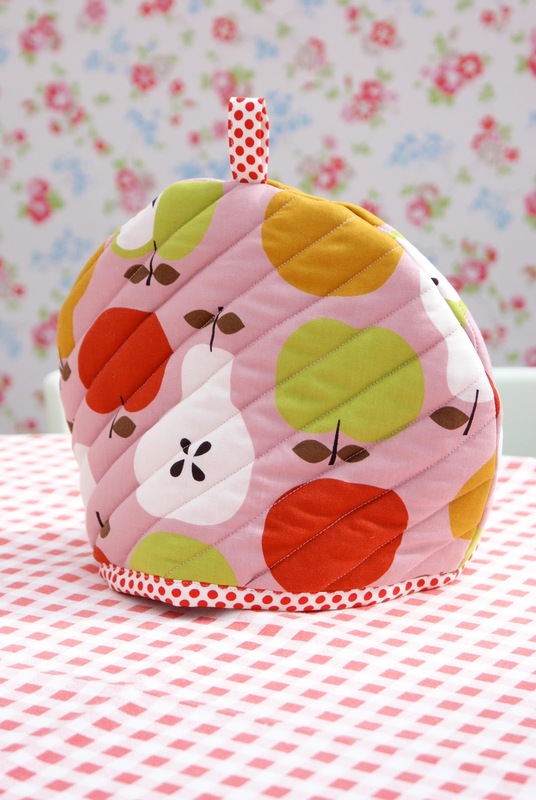 the tea cozy is super cute too! Ooh, it's looking so good, I can't wait for the finish! Love the backing and the binding fabric. Especially the binding fabric, it's gorgeous I bet it's going to look wonderful on it. How exciting! I'm so happy the quilting is going along smoothly. It's easy to get discouraged at that point. Although that happy binding fabric is something to keep you at it until the last row is stitched--too cute! And your tea cozy is so darling. I think polka dots should be in every stash, no matter what a person's style reflects. Your tea cozy is adorable! I love your backing and binding choices. I can't wait to see it all done! The quilt looks wonderful, can't wait to see the finish! oh, pretty binding! it's going to be great! your tea cozy is so sweet!! the fabrics are super cute!! i just adore the binding you are using for the granny squares. the back is also so pretty..love the stripes and the floral! !